In 2008, British soul singer Adele came storming across the music charts with her debut album 19, and music has never been the same. From “Chasing Pavements” to “Someone Like You”, Adele has taught us that it’s acceptable to feel all of the feels. As we celebrate the release of her highly anticipated third studio album 25, here are 22 things you never knew about Adele. 1. Without MySpace we never might have known Adele. Adele got her record deal after a friend posted her demo on MySpace. The indie label that signed her, XL Recording, was the most successful label in the world in 2011 almost exclusively due to Adele’s success. Their other artists include Vampire Weekend, FKA Twigs, The White Stripes and M.I.A. 2. 25 is actually Adele’s 2nd attempt at a 3rd studio album. About a year and a half ago, Adele thought she had enough songs for the album. She took them to producer Rick Rubin for his input and Rubin told her, “I don’t believe you.” He felt like the songs didn’t have much depth and that Adele was rushing, so she went back to the drawing board. 3. Adele wants Rihanna in her squad. Forget Taylor Swift‘s squad! In a recent Rolling Stone interview, Adele said, “Maybe Rihanna can be in my squad! That would be really cool. Oh, God. She’s life itself, isn’t she? I love her.” We definitely agree. 4. In 2008, Adele canceled her entire US tour because of her then-boyfriend. She admitted later, “I was drinking far too much and that was kind of the basis of my relationship with this boy. I couldn’t bear to be without him, so I was like, ‘Well, OK, I’ll just cancel my stuff then.” Luckily that ex-beau is long gone. 5. Adele & Blue Ivy have something in common. Adele’s full name is Adele Laurie Blue Adkins. Her middle name is Blue because her father loved Blues music. 6. Adele went to school with Jessie J& Leona Lewis. All three women attended The BRIT School for Performing Arts and Technology at the same time. Amy Winehouse was also an alum. Clearly, it’s a school that breeds legends. 7. “Hometown Glory” was the first song Adele ever wrote. Adele was only 16 when she wrote the song, and its about a neighborhood called West Norwood in South London. However, “Chasing Pavements” was actually the first single to be released off of Adele’s first album 19. 8. Adele is OBSESSED with The Spice Girls. Not only did the British girl group influence Adele’s passion and love for music, she would also impersonate them, providing entertainment at dinner parties as a child. 9. Meeting Adele backstage has a price. If you want to hang out with Adele backstage, then you are required to donate at least $20 to the UK charity Sands. The charity supports anyone affected by the death of a baby and promotes research to reduce the loss of children’s lives. During the UK/European leg of her Adele Live Tour, the songstress collected $13,000 for the charity. 10. Adele is out of touch with pop-culture. In her recent interview with Rolling Stone she said, “I’ve lost touch with music. Not, like, all music, but I feel like I don’t know what’s going on in the charts and in popular culture.” There is nothing wrong with being unplugged and unbothered. After all, Adele has been super busy over the last couple of years being a mum and working on her album. 11. Adele’s music video for “Hello” was the first ever to be shot with IMAX cameras. Not only was the video shot using the highest resolution cameras in the world, it also broke records with 50 million views in just 48 hours! 12. Speaking of record breaking, Adele is a Guinness World Records holder. Her second album, 21 stayed on top of the charts longer than any album since 1985. Adele is also the first woman in history to have three simultaneous singles in the top 10 on Billboard Hot 100 as well also two singles in the top 5. 13. Adele is no longer a smoker. 14. The Godfather is her favorite flick! No wonder Adele is so gangsta. 15. It took Adele 94 days to reveal her son’s name to the world. 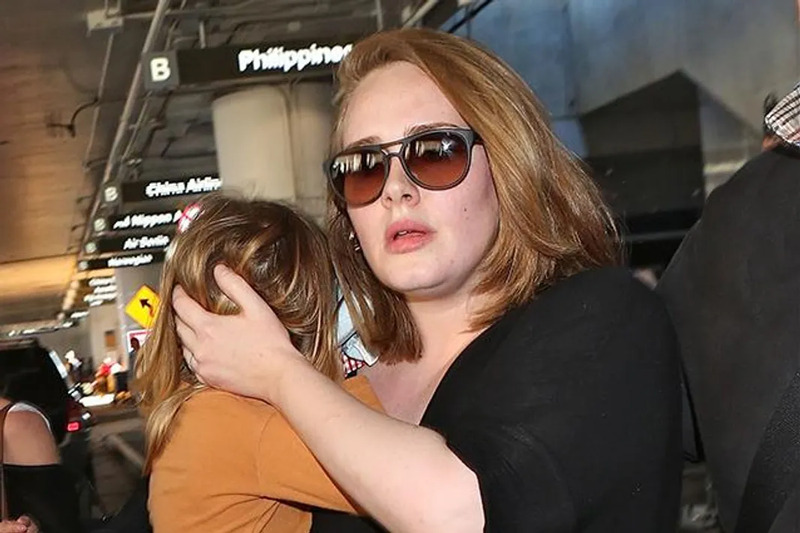 Adele is super protective over her son Angelo, and has successfully sued the British paparazzi for taking photos of him. 16. She wrote the James Bond theme song “Skyfall” in 10 minutes! She won an Oscar and a Golden Globe for the song. Did we mention that she wrote the song in 10 MINUTES!!! She has terrible stage fright which leads to anxiety attacks. In fact, she doesn’t even known if she will be touring for 25 yet, she’s giving herself until Christmas to decide. 18. Adele never thought singing would amount to anything. She only sang because she enjoyed doing so. 19. Adele’s sophomore album 21 is the U.K’s top selling album of the 21st century. 21 was also named album of the year at the 2012 Grammy Awards. 20. Adele lives for George Michael. She even dressed up like him for her 27th birthday! 21. “Someone Like You” was record breaking. It is the sole vocal and piano only ballad to ever take the top spot on the Billboard charts. It also broke all of our hearts. 22. Adele isn’t just a vocalist. She can play the guitar, base guitar, and clarinet.